Yeah, so it's those two teams that seem to own college football these days in the championship again. ND and OK were, well, less than up to the task. I suspect Georgia would have beat either one no problem. Alabama and Clemson are playing in the big dance once again though. Let's get it on! I think its gonna be a good one if both teams bring it. As shown, as bad as Arkansas was this year, they scored more on Bama than any other team this year I think. Anything goes in the final, and it doesn't take too much to get mentally stumbled. Gonna be a big test for both sides I hope. 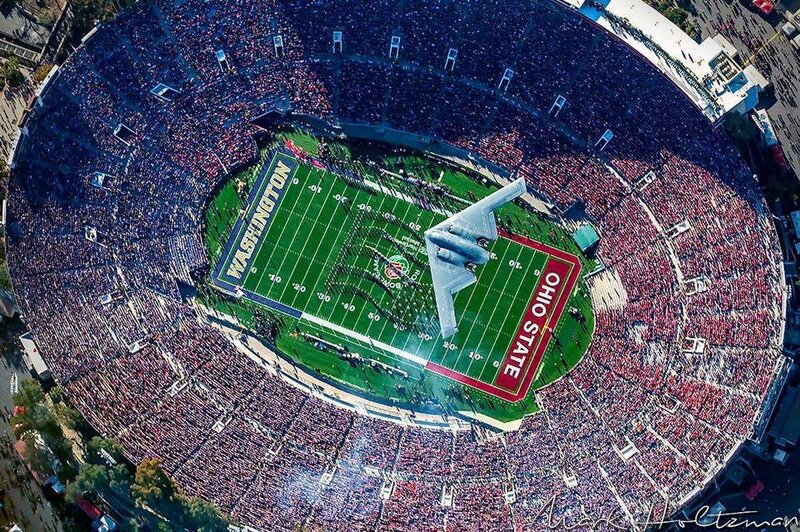 Rose Bowl: Man, the Ohio State band was cranking it with Bohemian Rhapsody! They are an all-brass band and they play great with a huge sound. I'm normally a critic of the drumline but I see they dropped the high waist drum style to much more modern drum corps style. They had a clean playing snare line and multi-tenors, no more single-tenor drums. They were always moving while playing, most bands don't do that. Fantastic show, Ohio State. Washington came out with their best show of the year doing musicals, including Oklahoma! and Phantom of the Opera. Nothing horrible but it was a Meh performance as far as I am concerned. To my ears OSU had the better band. And halftime is why we watch football, right? Rose Bowl: Man, the Ohio State band was cranking it with Bohemium Rhapsody! The are an all-brass band and they play great with a huge sound. You didn't happen to catch the score? If it were me, I'd score OSU a solid 92.6. Washington closer to an 81.05. I knew you’d like the OSU band. We enjoyed seeing and hearing the bands. Bohemian Rhapsody was way better than Oklahoma. Who picked that? Halftime was the only good part of that game. Ohio State played a great power arrangement of Bohemian Rhapsody and even though you can't hear the loudness, you can hear the intensity. I promise that if you were in the first 30 rows in front of the Buckeye band, you could hear it from there! They would pin your ears back with that sound. TBDBITL, (The Best Damn Band In The Land) finished the National Anthem and WHOA there B1G boy!!! Yes, the pilot was from Ohio! Hook 'em, Horns! I didn't expect a win over Georgia. I didn't expect a win over Georgia. Texas showed up ready to play and Georgia looked lethargic. Great season for the Longhorns. Poor Georgia looked like if anything could go wrong, it would. The early punt for 7 yards. Plus, the other punt deep in Georgia territory where the punter's knee hit the ground before he caught the snap. Ughh for Georgia! I kinda liked the win myself... "On any given day!" Bwa ha ha! RIP Tyler Trent......#1 Purdue fan. Purdue's President Mitch Daniels said.....Tyler has done more for this school in 6 months than he could do in 50 years. RIP Tyler. You were an inspiration. Boiler Up! Of course, as long as it’s one and done, even going to a 64 team bracket could not guarantee the best team emerges victorious. Does anyone truly believe that Maryland is better than Texas, or that Purdue is better than Ohio State? Does anyone truly believe that Maryland is better than Texas, or that Purdue is better than Ohio State? They were on one day.